What inspired you to write Topaz Reign? I’m a little embarrassed to admit that it really started with a dream. I’d recently finished writing a different book I was really excited about, but was more women's fiction than young adult. Then one morning I woke up from one of those dreams that make perfect sense while you’re in them but fall to pieces when you wake up. It involved having to rescue a friend from certain death by getting a marble-like stone out from under her bed--I know, super random and weird. But it changed my direction. I realized that the stone thread from that dream would make a really cool YA twist on the fairy tale The Princess and the Pea. I love reading fairy tale retellings, and the idea of twisting one up that hadn’t been done before was so exciting. Immediately, the story spun to life inside my head, and I stopped thinking about that first book and started working on this one. Even once Emerald Bound was finished, I felt there was still so much more I wanted to see the characters do, and so many more places I could take it, that I knew I wanted to do another. Hence, Topaz Reign. 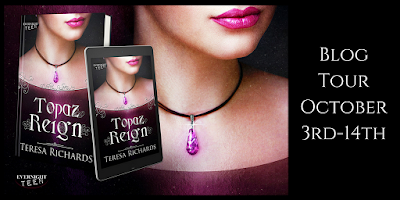 Is there a message in Topaz Reign that you want readers to come away with? I really didn’t write this book with the intent to deliver a message, but I hope readers come away with a new appreciation for family. I also hope readers will realize that it’s possible to be strong even when you lose your support network and the odds are stacked against you, but it’s also okay to accept help when it’s offered. I love both of my leading ladies—Maggie and Lindy. But this book was about Lindy coming into her own, while Emerald Bound was more about Maggie. I love the person that Lindy became through Topaz Reign. She handled herself with dignity and poise even in the toughest of circumstances, and I admire her for that. What are your hopes/goals as an author, and what other projects do you have in mind? I write because I love it, but writing something you know you’ll be able to share with other people makes it that much better. I love talking with teens about writing (and, really, all things life) and I hope to inspire them to chase their dreams in a way I didn’t have the courage to do when I was their age. I signed with a literary agent about a year ago, with the goal of bringing my stories to a wider audience. We have a book currently on submission with editors, a YA contemporary suspense, and another YA contemporary that I’m working on. I don’t want to say too much about either project, but the first features a piano playing lottery winner, and the second involves roller-skating gymnasts. How’s that for vague? Well, right now I’m sitting in the back seat of my car, in a deserted parking lot, writing on my laptop while I wait for the library to open. Does that count as unusual? I have five kids between the ages of six and sixteen, so I have to make use of every moment I can. I often find myself writing in the car as I wait for somebody’s class/lesson/school activity/club to end, or waiting outside the library before it opens because I had to take one of my kids to school or to a doctor appointment before school and it would be a waste of time to go home. There are fewer distractions in the car (actually, like none—it’s not comfortable enough to lay down for a nap, and there’s no tv or internet or dishes or laundry) and I’m often able to focus better. I love music. I play the piano when I need a mental break (it’s better than a therapist, I’d say) and I’ve always got a song stuck in my head (which I sing out loud in all sorts of places I shouldn’t, like the grocery store and the movie theater). I also enjoy watching movies and spending time with my family and friends. And reading, of course. Always reading. Oh, man, that’s like asking me to pick my favorite child. There are so many books I love, and for different reasons. The Book Thief is at the top of my list, just because it’s so surprisingly different in the way that it’s written. And, of course, the story is amazing. I also love a little book called Ella Minnow Pea for being so clever. And then there’s the Cinder series and the Splintered series, both fairy tale retellings that I adore. And there are so many others. So, yeah, I’m sorry but I can’t pick just one. Books are the best!